For quite a while now, I've been thinking, off and on, about centralizing our search functionality. Currently, our indexes are deployed locally with the application, which is something of an operations nightmare. As we scale out by increasing the number of machines in our tiers, and introduce brand new tiers with new products, the situation can only get worse. Some time ago, I had built a simple RMI server which would be a central repository of all our indexes (perhaps scaled out horizontally using a load balancer), but that would have needed quite a bit of change to our codebase to perform reasonably, so I abandoned the idea. Other things came up and I forgot about this - from the looks of it, reports of operator nightmares seem to have been grossly exaggerated :-). Solr is very customizable, but it offers no customization hook for the one place I need it most. Our search is really a meta-search, aggregating results from multiple internal sources, each of which can be backed by multiple indexes, each of which is built using radically different analyzers. Solr follows the one IndexSearcher per instance model, which is unlikely to change, since its update strategy is based on this assumption. We could probably use Solr's distributed search to get around that, but the performance penalty would be too high. Unlike Solr, our model of updating indexes is to simply replace them with a freshly built one. Logic to detect the availability of a new index is built into the code, so no application restarts are necessary. I could actually implement this with Solr with a custom RequestHandler, much simpler than is currently implemented in our code. Mule uses its own XML configuration. The configuration file shown below contains the details of the entire Mule service. You can find more details about configuring a Mule service here. Mule configuration integrates very nicely with Spring's. The only application code in the service is the SearchServiceUmo, which is defined in the components-spring.xml file below, using standard Spring semantics. This file is referenced from the main configuration file using an import. The workhorse class is the SearchServiceUmo. It takes in a Map of request parameters representing a query from a remote client, and executes a Lucene search against a local index. It then returns a List of result beans (a POJO, shown below), converted into an XML stream. One important thing to note is that there is no mention of any Mule API or classes, ie, coupling between application code and Mule is only via the XML wiring. * User defined search service. * but cannot be used without complex shenanigans, as far as I can see). * @param params the request parameters as a Map of name-value pairs. * @return the response XML string. * also use it for query building. * @param q the query term. * @return the Query object. * we use a plain TermQuery here. * @param tags the tags to filter on. * @return a Filter object. * We always sort by the natural order of the sort fields specified. * sort order for that field. * @param sortFields a comma-separated list of sort fields to sort by. * @return a Sort object for this search. The SearchResultBean is a POJO. I have removed the getters and setters to keep the code short. Use your IDE to generate them. Note that if you want to deserialize the XML back into this bean on the client side, the bean must exist on the client's CLASSPATH as well. * be able to deserialize this into a SearchResultBean. The Main class is not needed if you are using a Mule installation. In my case, this allows me to startup the Mule service from within my IDE, and is adapted from the template in the archetype. 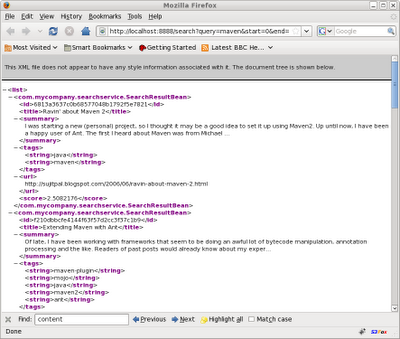 * Launcher for the Mule based search service. Client code could call this using a simple HTTP Client, which would deserialize the XML (perhaps using XStream) back into a List of SearchResultBean objects, and use it as required in the application. In the case of a more Mule aware organization, the client would probably also be a Mule service. As you can see, Mule provides a lot of components and XML wiring features that make it easy for the application developer to concentrate on the business logic and leave the integration details to Mule. However, while I was building this application, I realized that it would be more pragmatic (and easier) to just build a simple web application wrapper. Obviously, this is not a reflection on the quality of Mule software. In a shop that is using Mule more heavily, this would probably be an ideal approach. However, ingesting the Mule elephant (sorry, mixing metaphors here) to just take advantage of its HTTP connector and a couple of transformers seems like a bit of overkill. Developers here are very familiar with Spring and Lucene, so building a simple web application is far simpler than learning the Mule architecture and all its components. Another thing I noticed is that there seems to be more emphasis on asynchronous messaging in Mule, and perhaps rightly so. In my case, I would have liked to be able to wire up a transformer after my component runs, perhaps in an outbound component, but since my service is synchronous, I can only configure my inbound endpoint, which does not allow transformers after the component is run. I ultimately ended up putting the post-transformation in the service code itself. Of course, Mule is a work in progress, so I am sure the functionality will show up in a later version if it doesn't exist already. If you know how to achieve this, please let me know. I found the following sites helpful during my development, if you want to try out something along similar lines, you will probably find them helpful too. Maven Archetype for Mule Projects from the Morning Java blog. The archetype provides a simple example of a Mule service which is very helpful. It is based on Mule 2.0.0-RC2, but a simple version change in the POM got me set up with the current Mule version (2.2.1 at the time of this writing). In addition, I had to add in the dependency to Lucene and the Mule HTTP Connector (see the POM snippets above). Mule Instance Configuration from the Mule documentation. This page provides some information about modeling synchronous request-response style messaging in Mule. A very informative article from InfoQ, written by Jackie Wheeler. This discussion thread provided me with insight about how to handle HTTP connectors in the application. I've been meaning to look at Solr for a while now, and I finally did it before starting on this application, to see if I could use Solr. The Solr Getting Started Guide was very helpful to set up a simple Solr instance which I could experiment with while going through the Solr code and documentation. Why don't you use an embedded HTTP server like jetty? Hi abhirama, yes, thats a good idea. I ended up making it a simple webapp (with a war file) - the application I finally ended up with used JSON serialization (instead of XML using XStream) and also provides a single JSP page for fine tuning the query manually before putting it into code, similar to the Solr admin page. Without the admin page, it would have made a lot of sense to use embedded Jetty, thank you for the suggestion. Do you have the finished webapp. I would love to test. Thanks Ilango. This post is actually using Mule to build a webservice wrapper over Lucene (not Solr). And no, I don't have this webapp anymore, I abandoned this idea in favor of a plain Spring app instead, although that approach isn't live either, since I haven't yet had a chance to convert over all our legacy code to work against a webservice.